Vanilla ice cream. Choc chip cookies. The Notorious B.I.G. Maxxis High Roller II’s. What do these things have in common? They are all classics. 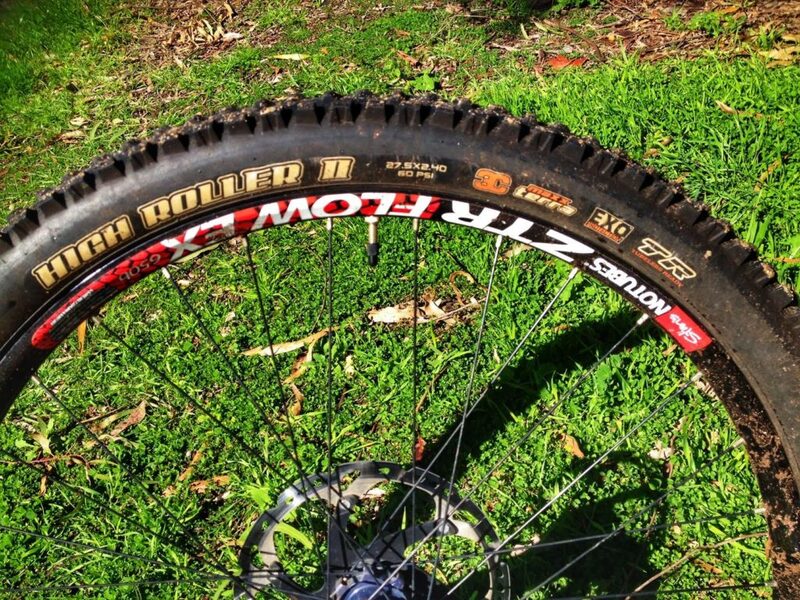 What can you say about one of the most widely used mountain bike tyres on the planet? Well, I can tell you this: the (HR2) is a big, sticky, rubbery mess of a tyre. The 2.4” size is especially voluminous, and when I say sticky, I mean super tacky. This tyre grips in such a wide range of conditions that professional racers have been using it on everything from full on technical downhill tracks to pedall enduro courses since its release. 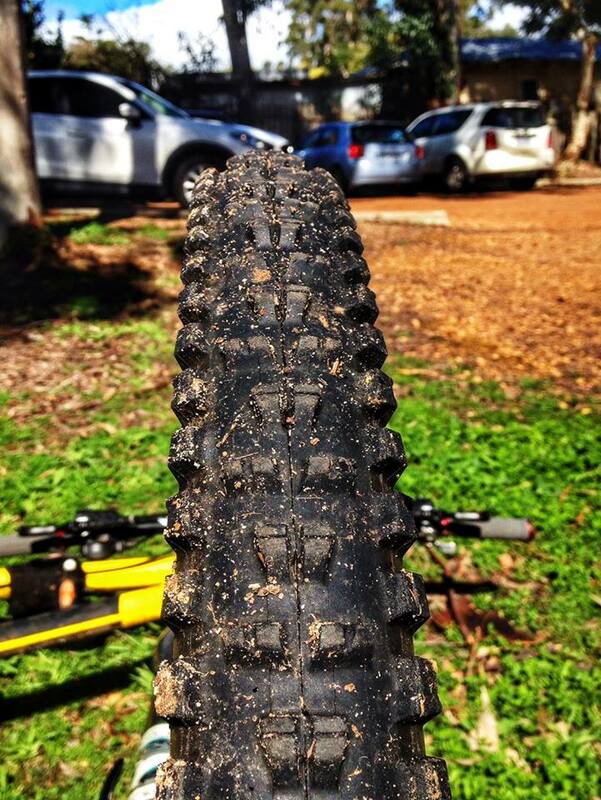 I think the tyre’s success can be attributed to a number of key design features. Firstly, there is the shape of the tyre carcass itself, which has a pleasing rounded profile. However, at a glance the HR2 appears to be quite a square tyre due to the sharply protruding and angular side lugs. The side lugs are a very soft rubber compound, and are also largely unsupported. This means they readily compress and conform to the trail when the tyre is leaned over, giving a huge contact patch when you need it most. This is my favourite front tyre for inspiring confidence in corners in almost any conditions from bone dry to sloppy wet. Some find this square shaped tread design adds to a slightly and unusually high rolling resistance for a tyre that is visibly less knobby than something like a Minion, hence why Maxxis themselves label the tyre as slower rolling than its burlier big brother. Others (such as myself and team rider Hairy Marron team rider Dean Davies) find that the HR2 actually rolls faster than the Minion and other more purely gravity focussed tyres. My take is that this is due in part to the HR2 having less rubber in the smaller tread blocks, which results in a higher rebound feel and less damping due to less solid rubber between the air chamber and the ground. I find that, especially in the higher end 3C Maxxterra compound, the HR2 has a more playful, lively ride feel than the better damped Minion, although obviously no where near the level of very lightweight cross country tyres such as the Ikon (reviewed previously). Whether you prefer this less planted tyre feel will come down to personal preference and riding style, hence there is sometimes a divide between those who run Minions and those who run the HR2. My only qualms with the HR2 come when it is run as a rear tyre in anything other than perfect loam conditions. The issues I have with the tyre in this application are a combination of riding style and the tyre’s construction. In corners I often enjoy ‘steering from the rear’, and I find that, on our local hard-packed or deep-rutted corners the unsupported side lugs are so soft that when pushing hard they can literally be torn off the tyre! This issue is compounded if you allow your rear tyre pressure to drop below optimal riding pressure. I don’t like the vague feeling of tyre roll at the back, and the HR2 is so grippy that I have to run slightly higher pressures to ward off tyre roll, which, coupled with the higher rebound feel of the tyre, can make for a bouncy ride at times, especially on a hardtail. 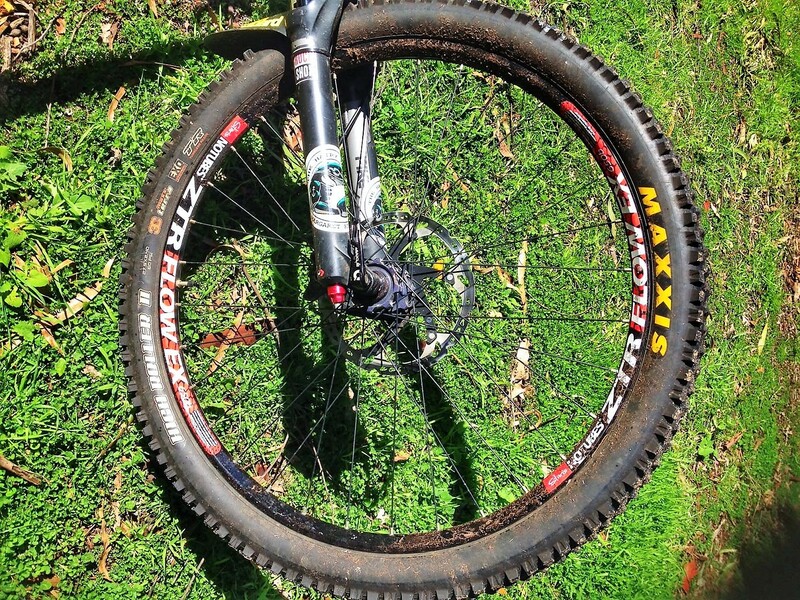 Therefore, my favourite tyre combination that I have ridden to date (bearing in mind that this is on a steel trail hardtail, which obviously lacks any mechanical rear end damping) is a 2.4” HR2 at the front for oodles of predictable cornering grip at any angle in the bike’s turn paired with a 2.3” Minion DHR II (as reviewed previously) at the rear. The DHR II as mentioned offers slightly improved damping, and the side knobs are much better supported and offer greater durability. I find that the more solid side lugs mean the DHR II has less cornering traction than the HR2 at the front, which I prefer as the back end is more likely to break traction first allowing a predictable drift, and it is also less likely to try and pull itself off the rim if the pressure is slightly low! This tyre combination isn’t going to gain me a podium at any XC rounds, but in the slop we are riding in at the moment it gives me a chance of staying rubber side down. As usual, I have come up with plenty to talk about when nothing really needed to be said. The Maxxis High Roller II is a classic tyre for a reason; it works in such a wide range of conditions and inspires confidence when trying to perfect your cornering technique which, after all, is the most important skill in mountain biking, if art form is not a more appropriate term. So come and pick up a Maxxis branded paint brush and start decorating that canvas!